Justin Ma and Matt Davis leave their jobs at 2K Games and try to make it on their own as indie developers. Everything is bigger in Shanghai. A bastion of economy situated at the mouth of the Yangtze River, the city hosts China’s main stock exchange, a glittering symbol of Shanghai’s status as the world’s largest and busiest port. Luxury hotels and businesses soar over a population of twenty-four million and counting. British colonial architecture, relics of the Opium Wars, sits in the shadow of tower high rises. Tunnels and bridges connect the two sides of the Huangpu River, unifying old and new Shanghai: a megalopolis where traditional styles clash with the glass and steel of modern architecture. At night, the city’s skyline flares into Technicolor brilliance. Neon flashes from all sides, illuminating a city of both antiquity and modernity. Thriving economies come at a cost. In 2013, pollution coughed up from innumerable factories and automobile exhaust pipes choked the skyline. Schoolchildren were proscribed from venturing outside their homes.1 Traffic thinned. Authorities cancelled sporting events, and high demand for masks and air purifiers left local stores running low on supplies. 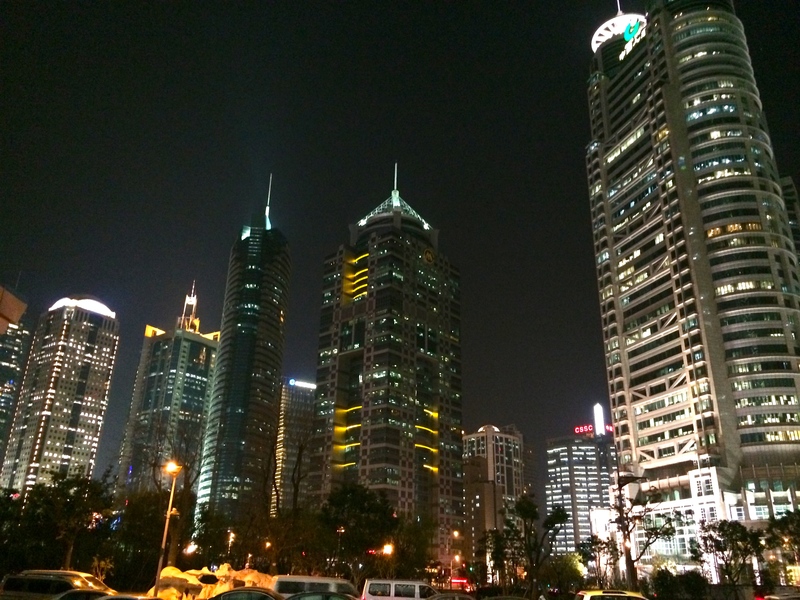 Lujiazui, a locality in Shanghai’s Pudong District. Credit: Wikipedia. Shanghai was not always so dense. China’s economic jewel originated as a fishing village between 5th and 7th centuries A.D. The city flourished thanks to high demand for silk, cotton, and fertilizer, three of its chief exports. In the 1990s, Shanghai began recording economic growth upward of ten percent per year through the start of the new millennium.2 As early as the mid ’90s, the Pudong district was a tract of farmland.3 Now, Pudong is the beating heart of Shanghai’s financial district. Financial movers and shakers were some of the first to benefit from the economic growth spurt felt across Shanghai and the People’s Republic of China. Game publishers were quick to follow. The high cost of personal computers and software relative to the populace’s median income led to growing interest in Internet cafes, where males between the ages of eighteen and thirty plugged into online games such as Blizzard Entertainment’s World of WarCraft for days at a time. Ubisoft, Electronic Arts, NCsoft and other publishers flocked to put down stakes in the East, hoping to cash in on the growing mobile and online-gaming scenes. In 2006, publisher 2K Games opened 2K Shanghai, the first of many Chinese studios the corporation would collect under the 2K China umbrella.4 Their first job was to localize Sid Meier’s Civilization IV for the Chinese market. Following that, they would pitch in on other titles in development at sister studios until they cleared enough room on their plate for their own games. The studio grew slowly, filling its airy bullpen with cubicle farms, coffee stations, foosball and Ping-Pong tables, and a lounge where developers could grab a drink and a snack. 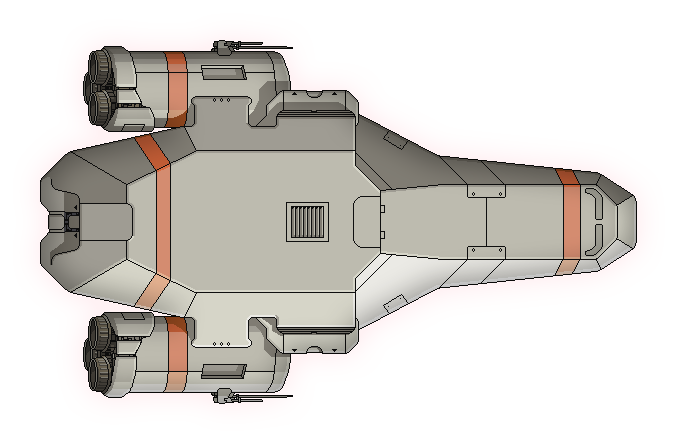 Concept art depicting an early rendition of the Kestrel vessel. Credit: Justin Ma. When a rep from 2K Shanghai invited him to relocate to China, Davis jumped at the offer. He arrived in late 2007 and became a jack of all trades, writing code for games on social networking services and porting titles from one platform to another. None of the projects set his world on fire, but it was a job in games, so he stuck around. Eighteen months passed. After work, Davis met up with friends outside the office to engage in one of his favorite pastimes: playing board games. Justin Ma, one of 2K Shanghai’s newest hires, quickly became a regular at the meet-ups. Shrugging off the rejection, Ma continued looking for jobs. To his surprise, reps from 2K Shanghai called him back. They explained that they happened to have need of someone with his diverse skill set to pitch in on BioShock 2, a shooter set in a dystopian underwater city. Ma’s job would be to design 2D overhead-view maps of each level. Ma accepted the offer in 2009 and ended up taking the desk beside Matthew Davis, who was writing code for Top Spin 2 for the Nintendo Wii console. The two clicked. When fatigue from the hustle and bustle of working on big-budget projects like BioShock and Top Spin set in, the two friends discussed a shared goal: to splinter off from the monolithic industry and design games of their own. Justin Ma’s favorite Christmas present of 2010 did not come wrapped in a bow. His parents and brother pooled their money and bought him a pass to the 2011 GDC. Ma was hyped for the trip. It would be his first time attending the annual show. More pressingly, working in China was fun and fascinating, but he had been feeling cut off from the global gaming scene. He was also burnt out. Tired of putting together maps, he often went home after work and fired up Game Maker, a program that let users build fully functional games without needing to write a single line of code. Ma and Davis played around with different configurations before deciding on a static layout for FTL. The player’s ship faces the right, while the enemy ship points upward. Upon setting foot in San Francisco’s Moscone Center, the site of GDC, Ma instantly felt at home. He attended talks given by legendary game designers, but it was the Independent Game Festival (IGF), a showcase where indie developers got to show off their homemade games, that captivated his imagination. At IGF, Ma noticed the glaring juxtaposition between big companies such as 2K and the scrappy indie developers. Big-budget publishers poured millions of dollars into facsimiles of money-makers like Call of Duty and World of WarCraft. Indie games did not require millions of dollars, a team of hundreds, and a minimum of four years to create. One person, maybe two or three, could build a game, put it up for sale on Apple’s App Store or Valve Software’s Steam digital games platform, and make a decent living if they sold around 100,000 copies. Big publishers like 2K had to sell millions of games just to break even on their investment in salaries, equipment, office space, and marketing. Independents could chase any wild what-if they imagined. Justin Ma (left) and Matt Davis at the 2013 Independent Games Festival. After some soul-searching, Davis decided he would never have a better opportunity to chase his dreams. He was in his early twenties, had a few games under his belt, and sat on a sizable nest egg from two years of salary work. Plus, he was an experienced programmer. If his funds ran out, he could get another job easily enough. Not that he was concerned. The notion of his bank account drying up was less alarming than the idea of continuing to wake up every morning and go to work in an office, even one with foosball tables. Davis’s girlfriend knew the perfect way to spend his sabbatical. Leaving behind the din and miasma of pollution in Shanghai, the couple traveled to Southwestern China and stopped in Kunming, known as the City of Eternal Spring for its temperate climate and flowers in perpetual bloom. Then they hopped on their bikes and began their odyssey. They pedaled south to Laos, rode northeast into Vietnam, and leisurely swung south again to explore Cambodia. Their travel itinerary was hardly rigorous. They slept in every morning, hopped on their bikes when they felt ready to move on, and soaked up the sights, sounds, and cultures of the countries and landmarks they visited. Tom Jupert, writer on FTL, came up with all sorts of scenarios to engage players each time they enter a new sector of space. Davis narrowed his list down to a handful of gameplay mechanics. He wanted to force players to make difficult decisions, and to have scarce resources be the motivating factor in making those decisions. These predilections came from Davis’s enjoyment of survival-horror games such as Capcom’s Resident Evil series, where the zombies roaming haunted mansions and derelict police stations vastly outnumbered the bullets remaining in the player’s clip. To Davis’s disappointment, true survival-horror was on the verge of extinction. Even Resident Evil had traded decision-making—expend valuable ammo to put down the undead clogging a hallway, or take a risk and sidle around them in an attempt to conserve resources—for bigger guns and hordes of ammo in order to keep up with chart-topping military shooters like Call of Duty. Permadeath, shorthand for “permanent death,” is a mechanic most closely associated with the roguelike genre, the namesake of which was Rogue, released in 1980 by programmers from University of California Santa Cruz. Sporting text-character graphics, Rogue had players descend into randomly-generated dungeon levels where every monster and treasure encountered was also cooked up from random numbers. Randomization guaranteed a different experience every time, keeping the game fresh and exhilarating—an essential ingredient, since most players only cleared a few levels before the dungeon’s denizens struck them down. Davis enjoyed roguelikes, but Ma was positively hooked. “I went through a phase maybe a year before we left 2K Games where I played every single roguelike I could find.” One powerful influence came from Spelunky, an independently-developed action game that featured gameplay elements popularized by roguelikes. Instead of exploring a dungeon from a top-down view a la Rogue, Spelunky had players running and jumping across randomly-generated caves from a side-view, similar to Super Mario Bros. “[Spelunky] was the first game where I discovered that you could take these ideas and apply them in other gameplay scenarios, and it works brilliantly.” Ma’s brain worked overtime, envisioning ways to stir roguelike elements into other genres such as side-scrolling shooters and even beloved game series such as Nintendo’s The Legend of Zelda. Ma’s and Davis’s influences extended beyond video games. Since returning home to Shanghai, Davis had been marathoning the Star Trek: Deep Space Nine (DS9) TV series. The show followed the crew under the leadership of Benjamin Sisko (portrayed by Avery Brooks), commanding officer of the Deep Space Nine space station. While previous Star Trek series were notable for their optimistic tones and utopian vision of the future, DS9 often explored darker aspects of the human condition and the moral ambiguity of life in “the final frontier.” Most episodes revolved around the difficult decisions Sisko had to make in order to satisfy both his and the Federation’s high ideals while balancing the complicated realities experienced at the fringes of Federation territory. The board games Ma and Davis played with friends also sparked design ideas. “Atmosphere-wise, Battlestar Galactica: The Board Game had a huge impact. We played that game to death,” Ma remembered. Based on the acclaimed 2004 remake of the original television series that aired during the 1970s, the BSG board game sees three to six players select an occupation such as pilot, engineer, or political leader, and board the titular Battlestar Galactica ship as crew members. Their primary goals are composed of putting out literal and figurative fires described on Crisis Cards, keeping the ship stocked with fuel and food, and performing jumps through space to stay one step ahead of enemy ships hot on their trail. Another board game, Red November, also left an indelible impression on Ma’s and Davis’ design sensibilities. 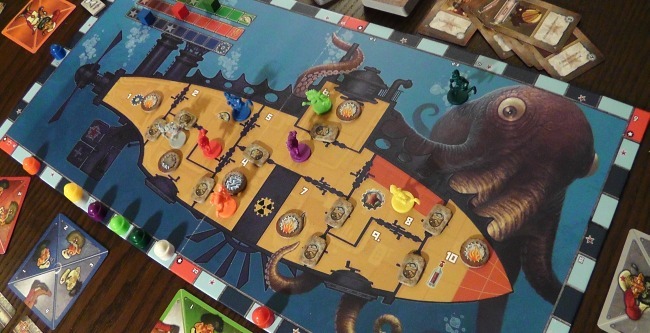 In Red November, players are in charge of a submarine suffering from crises that have a nasty habit of stacking up. Water pressure rises as the sub sinks to lower depths, the nuclear reactor teeters on the brink of overheating, water spurts from leaks, oxygen ticks away, and a kraken materializes from the encroaching darkness. Players spend their turns rushing from room to room attempting to resolve each disaster. “If you know the game, it should be obvious just looking at how the rooms function and how the crews operate that we were inspired spatially by that game,” Ma explained. Ma and Davis loved the premise of Red November and Battlestar Galactica. Casting players in the role of a commander in charge of keeping a vessel and its crew in one piece was a situation most games did not explore. In most space-themed games, players were pilots in charge of one small ship and focused on shooting down enemies. Subset Games, the name they chose for their two-person expedition, seemed similarly appropriate. “All the games we talked about wanting to make were niche games, so we felt like we were designing for a subset of gamers,” Ma explained. On the elements that would come to make up FTL, the two friends concurred. Whatever else it would end up becoming, the game would revolve around randomization, permadeath, and high-stakes decisions. 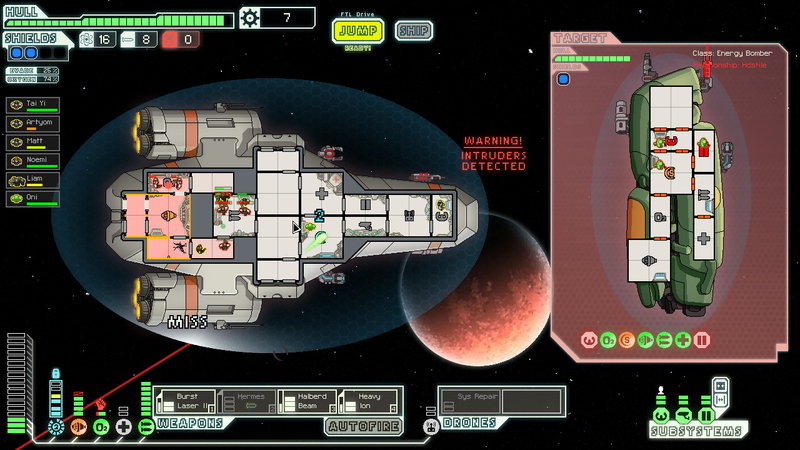 FTL would be a game they wanted to play, not one shaped by market trends and bottom lines. Their vision was hazy, but clear enough to serve as a springboard from which they could dive into work on the small project. “We started FTL, which was supposed to be a short-term project while we lived off our savings,” Davis said. 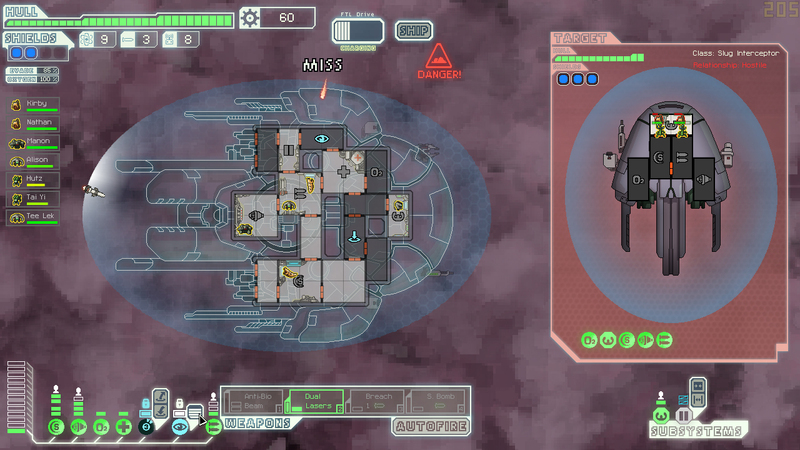 FTL: Faster Than Light. 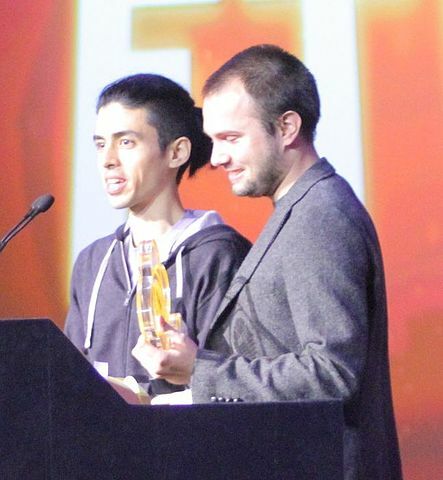 Justin Ma and Matthew Davis agreed on the name of their game almost immediately upon cutting ties with the big-budget games industry and striking out on their own. Everything else, including howFTL would unfold, the challenge it would pose, and the scope of its space-faring grandeur, was still up in the air. By the time I graduated, I realized I wasn’t a massive fan of programming: Interview with Matthew Davis. All quotes from Matthew Davis come from interviews conducted from 2012-2014 via email and Skype. When I was in China, I had some connections at 2K Games Shanghai. Interview with Justin Ma. All quotes from Justin Ma come from interviews conducted from 2012-2014 via email and Skype. I wanted to thank you for this grewat read!! Thanks! I’m glad you enjoyed the story.